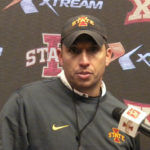 Iowa State has climbed the ladder in the Big 12 Conference on the strength of a defense that ranks as the league’s best. That unit will be tested in the December 28 Alamo Bowl by Washington State’s “air raid” offense that ranks at the top of the PAC 12 in passing and total offense. Washington State coach Mike Leach says the Cyclone defense will provide a difficult challenge. The Cougars average more than 38 points and nearly 380- yards of passing per game.